William Morrow & Company Inc. This is the groundbreaking book that introduced the unique system to the West. 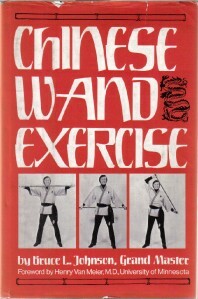 The author, Bruce Johnson, had been teaching the art in the USA for over two decades when it was published. Sadly this book is now OUT OF PRINT but it can still be obtained on Ebay and from specialist book stores. Bruce Johnson guides the reader through each of the 17 Exercises in detail. The diagrams and photos are clear and explanatory. 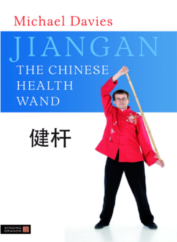 there is no detailed explanation of the esoteric concepts or how the exercises relate to specific acupuncture points or meridians but Johnson does `hint’ so that anyone with knowledge of Eastern mind-body concepts such as Chakras or meridians will be able to recognise the esoteric background to the Chinese Wand Exercises.